Now I am already 17 weeks/ 4 months old! 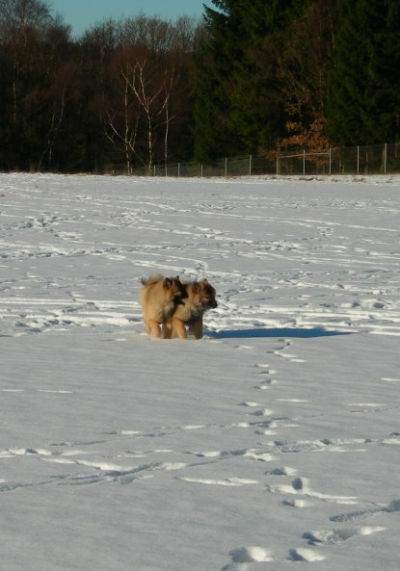 Last weekend (10/ 11 January 2009) was just great! 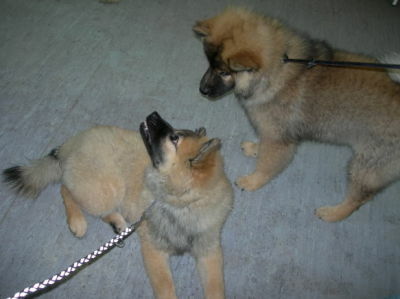 Saturday afternoon my family went with me to Siegen, for a walk with other Eurasier dogs. 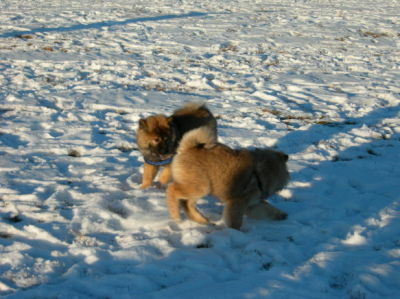 At first I had no idea what I was up to, but then, when we arrived at the parking lot, I saw them all: lots of Eurasier dogs! When we got to the parking lot they were all over the place, in all different colours and ages, with their human families. A lot of hugging and greeting was going on between the two legged and the four legged friends. Werner Groos and his wife Elke, the leaders of the KZG group Siegerland, put a lot of effort and work in the planning and working out of a great weekend, and I think, that besides me and my family, also all others enjoyed the weekend tremendously. A big "Thank you!" to you and your helpers!!! Well, at the parking lot I was greeted very sweetly by Sinok vom Katharinenholz, who is only 2 weeks younger than me, and who wanted to play with me right away. I loved running around and playing with him. Also I met my sister Berta there. What was amazing was, that we all were allowed to play at a huge meadow. Even the really big and beautiful males allowed me to sniff them. It was a lot of fun to play with all my fellow Eurasiers. My Family said, that they can't imagine that the same would be possible with other dog breeds: more than 60 dogs of all ages and both genders were playing together, without knowing each other prior to the meeting. It was just great! 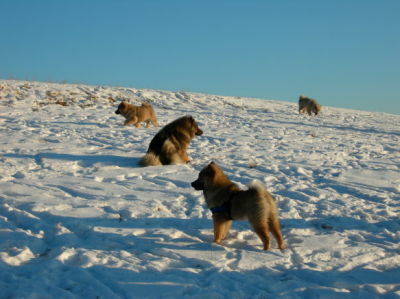 Wherever I looked there were Eurasier dogs. Later that evening my family and I went to a festival hall to celebrate with the others 30 years of KZG association. Well, I was thinking that the humans were better off with celebrating, because they were served from a very delicious buffet, and I had to lay under the table. 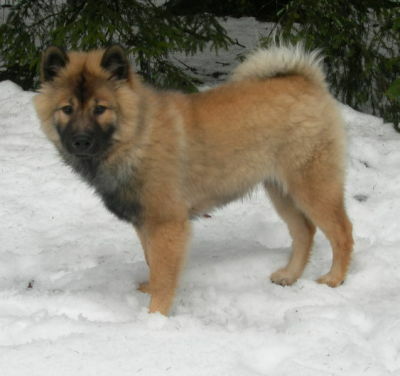 But being a real Eurasier, we are just always friendly and content, and so I did not enyv my people the food or the great time. And my Alina gave me a piece of cheese as a treat. Yes, I trained my people very well, and they constantly proof to me that I can rely on them with getting my rewards. Sunday morning something really exciting happened for me. Well, I already expected it, because knowing my family, they do not just ask me out of my bed (sorry, my vetbet) for nothing this early in the morning after going to a party. I was a bit puzzled that they brushed my fur this early in the morning. 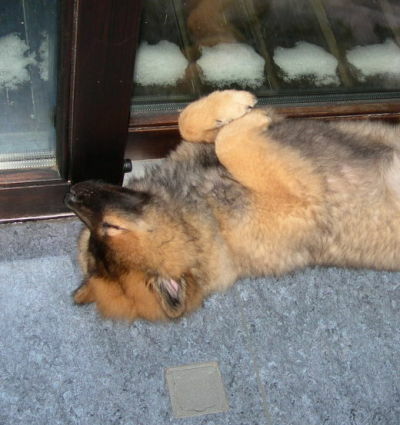 I was even too tired to growl at them for pulling my hairs. Anyways, we got in the car and drove in the direction of my puppy school, and I started thinking that I just mixed the times up. 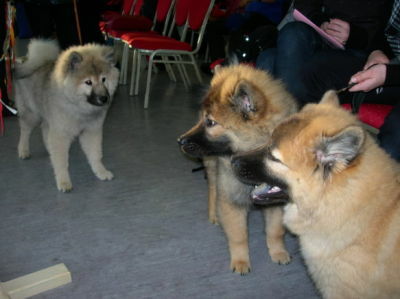 But then we passed the puppy school and a short time later I realized what was going on: I was about to meet Eurasier dogs again! Yeah! 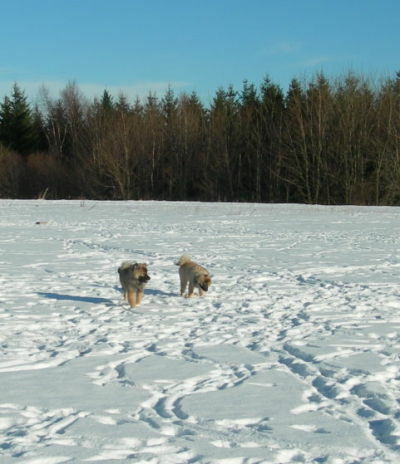 I jumped out of the car totally happy, and we went in a huge hall after a short wallow in the snow (why did my family brushed my fur?). 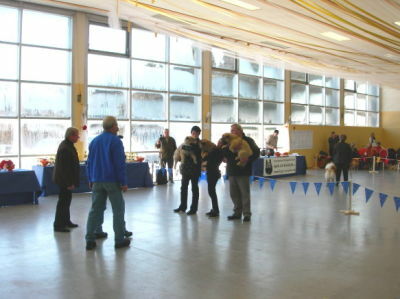 First thing the people at the door wanted to know was if my vet gave me my shots (she did) and then I was allowed to enter the exhibition hall. 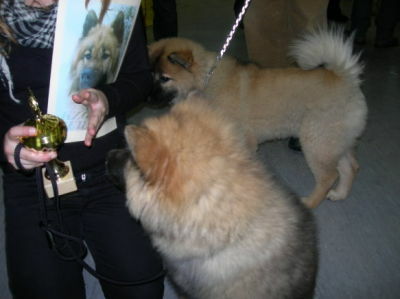 And there was the next surprise: I met my sister Bora again with my breeder, Mr Altvater. WOW, I was so very happy. At this picture you can see my sister nibbling my ear. Isn't she cute???!!! 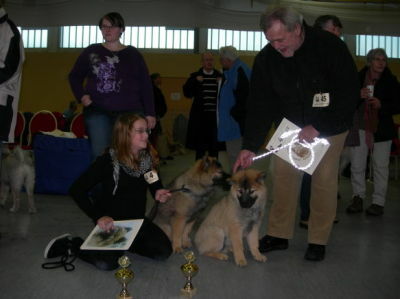 Here I am walking with my Alina for the judges. The judge, Mr. Sator, watched me very carefully, and also checked how I am moving. 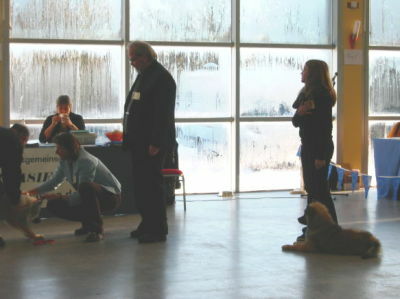 He liked what he saw because he gave me a "very promising" as assessment, which is the best grade for puppies. And he wrote down really nice things about me. I think, I like this man! 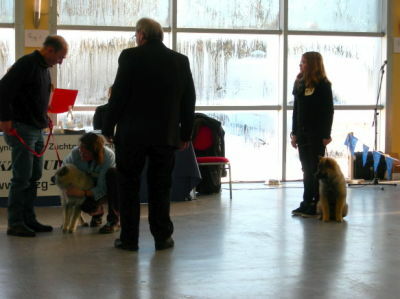 Here you can see me and my Alina watching the other little male puppy being examined by the judge. Hmmm, I wonder if he is as ticklish as I am? After my sisters and I had been examined by the judge the press came over and they took pictures of us. At this page press release you can see a picture and read the article (if you are able to read and understand German). Afterwards we were allowed to play outside in the snow, and after so much excitement we enjoyed it even more. 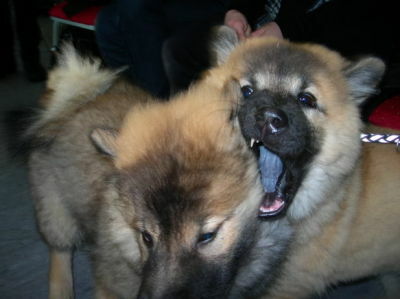 Don't you think that Bora and I look a bit alike? What is this thing Alina is holding in her hand? Oh wow, we got a trophy! My sisters and I all got a "very promising" as assessment, and our families are very happy and proud of our accomplishment. All in all it was a fantastic weekend and me and my two legged family had a lot of fun. 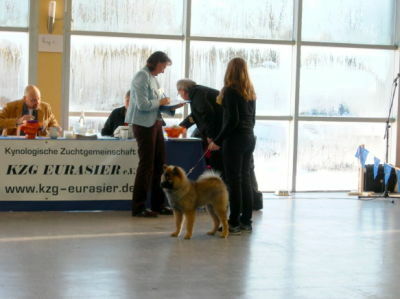 Now they enrolled me at the next exhibition and the Eurasier meeting in Münster, and we are all looking forward to it.